Discussion in 'White Hat SEO' started by Gillyrocker, Jul 7, 2015. I'm just wondering which one is better to startup as an affiliate marketer? I know both of them are good at own their perspective, But I'm little bit confused to which one is best to startup for me. How much estimated cost should be required to become amazon affiliate. The guy has written well, I shared it with you for getting some idea about Amazon affiliate vs Google Adsense. I think everyone should try AMAZON CPM. I vouch for Amazon. Did some split testing on my website and earned a lot more with Amazon, so I disabled Adsense and now my site is ad-free. Cool article, I might say. Just try Amazon first, then Adsense! I tried them first days they published Amazon CPM. I made more money from Amazon and you can even put Adsense ad if Amazon don't find any ad to put for CPM campaign. Yes, I agree with adrian. amazon is perfect for me to startup. AdSense is much better. If you have anywhere near decent CTR for your ads and even a $0.80 CPC niche you should easily exceed Amazon. AdSense pays per click, to get paid with Amazon you NOT ONLY need to get a click on your "ad" (product link) but it also needs to convert. Then you get a PATHETIC 6% payout which is worthless on anything but products over $100 considering maybe 5% of Amazon clicks convert. It's useless for anything but high ticket items IMO. I'm trying a "best *product*" list atm maybe it will perform better for me. Up til now I have around $15000 from AdSense and $50 from Amazon. Amazon is a very unethical company too I'm always wary of dealing with them. You can see how they're always trying to trick their customers into paying for Prime, always new schemes to trick and steal. So rich yet they will do anything to get more more MORE. Tbh they probably only credit you for half the sales you make. 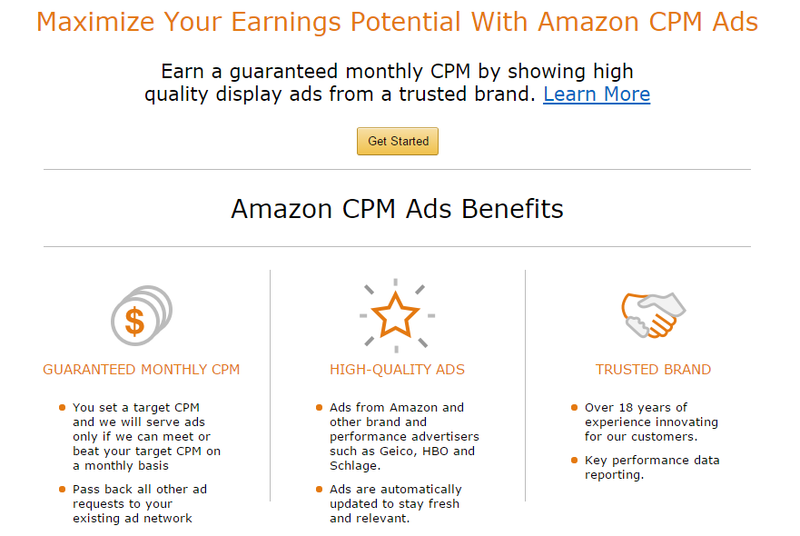 Amazon has now introduced their new CPM advertising model, which means that they pay you per click just like AdSense. What's even better is that you can set the minimum CPM, and you can use AdSense as fallback. Adsense has gotten me nothing but useless small payments and everybody in my niche has AdBlock, so ads are useless. I'm doing some smart contextual advertising along with some other media advertising to convert clicks to sales, which in the end pay a lot more. You can use Amazon in ANY niche and you should. Amazon is one of the safest online store in the world and they are the second biggest... They have an award winning customer service and I've bought from them at least 20 times and NEVER had a problem. Didn't know about their CPC thing, is it really CPC or CPM? CPM has always been poor for me even with AdSense... I always earn more from a few clicks than from 1000 "impressions". I will look into this right now sounds promising... Thanks for the heads up. But you can set your CPM so if you put 10$ CPM they will maybe serve you 400 ads on 1000 visitors, but 600 others will get alternative that you put and you can put Adsense there. As for which is better depends on you. For me, I find Amazon is more logical approach because you will be using SEO to rank in google, Right? It's great thing to mix Adsense and Amazon if you can, at least for niche websites. Amazon is strict, but it's good to know that they are for sure less strict than Adsense. Both are good! but in my opinion adsense is easy. You know, I vote for Amazon affiliate business! Amazon is a huge marketplace in the whole world! Personally I work with Xenia Plugin. It allows to add thousands of Amazon products to WordPress store quickly and easily. The Plugin will put your Amazon Associate Program ID in all links back to Amazon, so you get commissions for all sales referred to Amazon. Interested to see the Amazon CPM model growing, I am doing okay with their affiliate scheme and would recommend it over adsense, but I build sites based around products in the first place so having something to 'sell' is important. If you are a Professional Blogger then you Should not afford to miss the opportunity offered by amazon affiliate marketing.